Scouts wear a teal green shirt, navy blue activity trousers, a group scarf with a woggle, and a Scout belt. Click here to save or print a copy of the diagram below showing the positions of the badges on the uniform. The sweatshirt can be purchased from Banbury Scout Shop. There are a number of core badges, obtained upon joining or moving on from the Troop, or for time spent in the Scouting movement. These include the Membership Award, Moving-on Award (Scout Troop to Explorer Scout Unit) and Joining-In Awards. 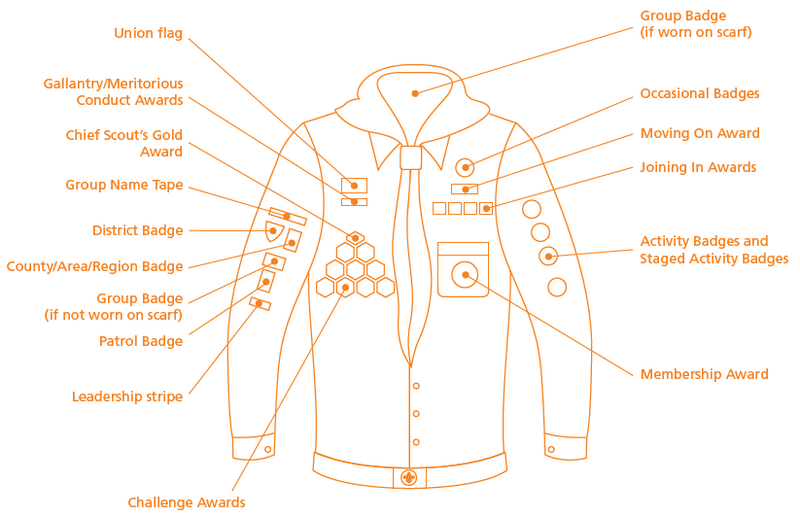 Many of the badges available are activity badges, which allow Scouts to show their progress in existing pursuits, but also to try all kinds of new things and form new interests. There are over 60 in total, so they can always find one that is of interest to them. Gaining a challenge badge involves accomplishing a number of more ambitious tasks within the Troop or community. There are 9 challenge badges across a number of themes, from the physical and outdoorsy to challenges dealing with the local community or issues connected with the Scouting world. The staged activity badges have been designed to provide a unified approach throughout the sections. There are 14 activity badges staged across the sections. This is the highest award available in the Scout Section, and is the badge all scouts are working to achieve by the end of their time as a scout. You achieve it by gaining all 9 Challenge Awards, as well as 6 Activity or Staged Activity Badges.